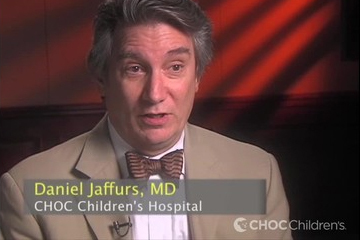 A recognized expert in craniofacial surgery and facial reconstruction, Dr. Jaffurs serves as the medical director of plastic surgery and craniofacial services and chair of plastic surgery at CHOC Children’s. He is keenly interested in pediatric plastic surgery, treatment of cleft lip and palate, and researching the genetic causes of craniofacial abnormalities. He has special interest in utilizing the technique of distraction osteogenesis for the treatment of various congenital defects. Dr. Jaffurs obtained his undergraduate degree in biochemistry at the University of New Hampshire. While in college, he became interested in research and molecular biology. He attended the University of Pittsburgh where he received both his medical degree and a PhD in molecular genetics. Following medical school he completed full general surgery training at the Guthrie Clinic in Sayre, PA, where he received numerous accolades for teaching. He is the only surgical resident ever to have received three Arnold P. Gold Humanism and Excellence in Teaching Awards. His plastic surgery training was completed at the University of Oklahoma which was followed by an additional fellowship in craniofacial surgery at the Medical College of Wisconsin and Children’s Hospital of Wisconsin. Dr. Jaffurs is a member of numerous professional organizations, widely published and has presented papers in a variety of topics in both clinical and basic science at national meetings. Kosins, A.M., Kohan, E., Shajan, J., Jaffurs, D., With, G., Paydar, K. (2010) Fixation of the media canthal tendon usinf the Mitek anchor system. Journal of Plastic and Reconstructive Surgery 126(6):309e-310e. Jaffurs, D., Denny, A.D. (2009) Diagnostic Pediatric Computed Tomographic CT Scans of the Head: Actual Dosage versus Estimated Risk. Journal of Plastic and Reconstructive Surgery 124(4):1254-1260. Scholz, T., Krichevsky, A., Sumarto, A., JAffurs, D.,Wirth, G.A., Paydar, K., Evans, G.R. (2009) Peripheral Nerve Injuries: An International Survey of Current Treatments and Future Perspectives. Journal of reconstructive microsurgery. Dr. Daniel Jaffurs, CHOC Children's, tells us about the possible causes the birth defect cleft palate and what can be done to correct it.